Facebook has emerged as big social networking website with loads of users interacting with each other. Besides the interaction, Facebook users upload lots of photos to their respective accounts. No wonder Facebook has more photos than popular image hosting websiteslike Flickr and photobucket. If you also love uploading lots of photos to your Facebook account, then checkout free tool “FB Photo Uploader’ to make this process real easy. It is a free open source Java based application that allows you to upload photos from desktop to your Facebook account. You can select multiple photos and add tags, description, name to them before upload. After selection of photos, hit the “upload to Facebook” button to automatically upload selected photos to your Facebook account. 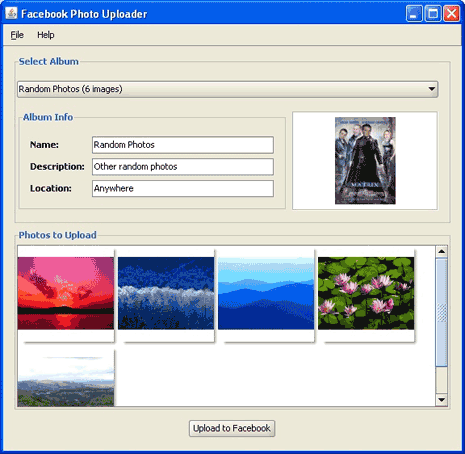 Download FB Photo Uploader to upload images to Facebook from desktop. Make sure you have Java installed for this application to work. I use isphotobomb.com , its very easy and cool. Seems ok… The tagging ability id quite low though; if you type a name down, (eg Ana Tan) but the official registered name is Tan Ana, this tool will not recognise it. It does not allow us to flip images either.